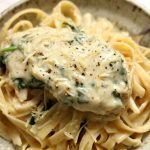 A creamy slow cooked chicken dinner with a garlic parmesan sauce and chopped spinach. We like to eat this chicken and sauce with fettuccine noodles or with mashed potatoes. Add butter, onion, garlic, broth, garlic powder, pepper and salt to the slow cooker. Stir. Nestle the mushrooms (if using) and the chicken into the crock. Cover and cook on low for 3-5 hours (this is the time for a 6 quart slow cooker and thawed chicken breasts cut into 1/2 inch fillets). Remove the lid. In a small bowl whisk together the evaporated milk and flour until it is smooth. Stir it into the slow cooker. Turn the slow cooker to high and cover for another 30 minutes, until the sauce has thickened. Use tongs to place chicken on a platter. Loosely cover with foil. Stir the parmesan cheese and spinach into the slow cooker. Salt and pepper to taste. Serve chicken and sauce with noodles, mashed potatoes or rice.